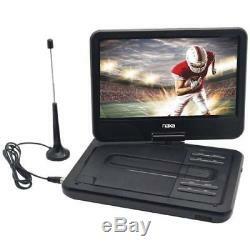 Naxa NPDT-1000 10 Portable DVD Player/TV Combo ATSC Tuner w/ AC/DC Power DVD/TV. Digital ATSC TV tuner receives free over-the-air HD TV stations. Plays digital media from USB flash drives & SD(TM) Card (max 32GB). Supports MP3 music, MPEG-4 video & JPEG photos. Rechargeable battery with up to 2 hours of playback. Plays movies on any TV with composite video connection. Includes AC power adapter, DC car cord, A/V cable & remote. We have 25 years of experience in retail/ wholesale business which carry many brand names such as, Canon, Braun, Philips, Sony, Nintendo, Samsung, Polaroid, Kodak, Coby, Panasonic and various General Merchandise products. Please contact your local custom broker for additional information/requirements. NOTE: THE SECURITY TAG AND UPC LABEL MUST BE INTACT AND THE SERIAL NUMBER ON THE PRODUCT MUST MATCH THE SERIAL NUMBER ON THE ORIGINAL BOX/ ITEM. The RA number or any other inscriptions must not be written or printed on the product box or package. We will not process the return if any of these conditions are not followed. Terms of Sales: All of our items are guaranteed to be exactly as described in our listings. Refurbished/Factory Reconditioned items are packaged by our supplier we do not and cannot open them and therefore we cannot and do not make any comment or guarantee as to the Cosmetic Condition of the Unit or its contents unless for accuracy purpose we will open it for inspection. Orders are processed the same day that we received them. The item "Naxa NPDT-1000 10 Portable DVD Player/TV Combo ATSC Tuner with AC/DC Power DVD/TV" is in sale since Tuesday, August 28, 2018. This item is in the category "Consumer Electronics\TV, Video & Home Audio\TV & Video\DVD & Blu-ray Players". The seller is "superiordeals33" and is located in Los Angeles, California. This item can be shipped to United States, Canada, United Kingdom, Denmark, Romania, Slovakia, Bulgaria, Czech republic, Finland, Hungary, Latvia, Lithuania, Malta, Estonia, Greece, Portugal, Cyprus, Slovenia, Sweden, Belgium, France, Ireland, Netherlands, Poland, Spain, Italy, Germany, Austria, Switzerland, Norway, Ukraine, Croatia.